Once again a roving crocodile takes the news, this time in Ciudad Neily, Corredores, where maintenance workers on Sunday found a lazying croc in the local hospital parking lot. The animal was some 1.6 metres (more than five foot) long. 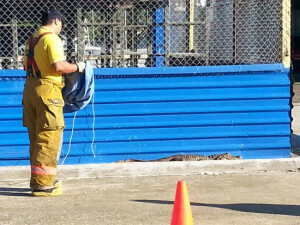 Cuidad Neily firefighters trained to trap crocodiles quickly subdue the roving animal in the hospital parking lot and released it in a local river. | Photo, La Nacion, FREDDY PARRALES. It is presumed that the animal came from a nearby creek, some 20 metres from the hospital. The croc was found by maintenanace workers underneath some vehicles. According to firefighters called in for the capture, the animal was quiet, but got aggressive when seeing so many people as the word of the presence of the reptile spread. The croc had blood in its mouth, so it is believed that it had suffered a severe blow. 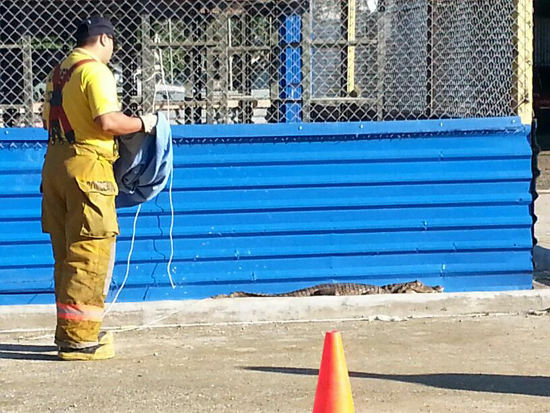 Firefighters in Cuidad Neily trained to handle crocodiles quickly had the animal under control and took it to Pangas de Corredores for its release. “It (Pangas de Corredores) is a place where they will cause no injury to anyone nor will it be harmed”, firefighter Vinicio Soto told La Nacion. Expert Iván Sandoval, of the Universidad Nacional (UNA), explained that during mating season female crocs can walk up to 150 metres ashore to nest. Crocodiles are present across Costa Rica’s Pacific coast, so it is not uncommon for crocodiles near homes and shops in built up areas close to rivers and creeks. Last week the exit of Manuel Antonio National national park was temporarily closed due to presence of crocodiles. Last month a man, in a drunken stuper, decided to go for a swim with the crocs an area of the Tarcoles river well known to locals and foreign visitors for the presence of the reptiles.